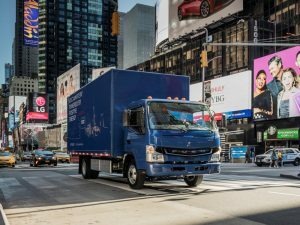 Series produced Fuso eCanter is the first electrically powered light truck to be equipped with CCS rapid charging technology. The light truck is destined for markets in Europe, Japan and the US. Powered by a 154hp (115kW) electric motor, the light truck has a range of 62 miles (100km) and has a load capacity up to 4.5 tons. Total weight allowance is 7.49t. 500 units shall be delivered within the next two years, with mass production planned for 2019 onwards. The vehicle’s lithium ion battery consists six high voltage packs with 420 V and 13.8 kWh each, making a total of 82.8kWh. Supporting both AC and DC charging, the battery pack can be recharged to 80% via CCS rapid charging standard in one hour, while AC charging takes around 9 hours to 100% from flat. Maintenance for the truck is estimated to cost 30% less than an equivalent diesel powered truck and fuel savings of roughly £885 (1,000 euros) per 6,200 miles (10,000 km) is possible, (power and diesel price dependent). The Fuso eCanter is estimated to pay for itself in 3 years.